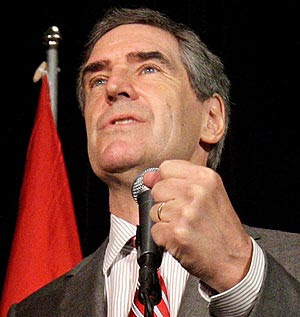 Darryl Raymaker: AN OPEN LETTER TO MICHAEL IGNATIEFF: YOU'VE EARNED YOUR STRIPES! AN OPEN LETTER TO MICHAEL IGNATIEFF: YOU'VE EARNED YOUR STRIPES! After today’s development I have no doubt but that the next letter I write to you I will properly address you as Dear Prime Minister. It was just last Saturday that I had the temerity to offer you some sound political advice on the basis of hard earned experience grinding it out for the Liberal Party for years in the hardscrabble and mean streets of Calgary. Talk about a huge, but delicate and inflated ego! He went up in a puff of smoke, as if David Copperfield himself might have had something to do with it. But now, as a result, the party is more united than it has been for a very long time! Good on you! I told you keep all of the grass roots happy and to honour our tested veterans and not stand in their way if they wished to serve. And you did just that for Martin Cauchon. Bravo! And I know you will do the same for Stephane Dion and others who are in the great Grit Hall of Fame. Thus, you are well on the way towards keeping all of the grass roots happy. Kudos again!! I told you to be guided by good advice. And by Jove – as Jacques Parizeau used to say – you listened to some Ontario wise men so we’re told and they gave you some good sound advice. Because of it you decided to give Cauchon a crack at Outremont! I toast you and your wise advisors! Keep them close to you – they’re really good! I told you to stop appointing riding candidates, and you are doing just that. Cauchon has got to run for the nomination. It will be good for him and good for the party. Look what it did for Justin Trudeau in the last election. It gave him instant credibility and stature. He ran for the nomination, won it, built up his organization and proved his mettle by winning a tough campaign! Exactly the way it should be done. And finally I told you that you were the boss and to put misguided underlings, power trippers and other riff-raff in their place. You did just that. You overruled your portly field marshal because you thought he was wrong. It took a while, but you did it and that is the main thing. Next time it won't take you as long. You did just what a boss should do! He was so distressed he quit. That’s the kind of guy Michael you never want to have in the trenches beside you, because when you need him most he won’t be there. Either that, or he’ll offer to support you in the event you win or tie. All in all, an excellent day for you, sir! Now its onward! Full speed ahead and damn the torpedoes! Keep up the good fight! Sleep well tonight knowing that during the last couple of days you have proved yourself a leader!